Need a winter antidote now. The NOAA forecast for Pittsburgh tonight and tomorrow, 4″ to 6″ of snow, may sound fantastic to Petra (my black russian), but it will mean going back again to that snow shovel. Got an image that radiates heat? This one sure does. 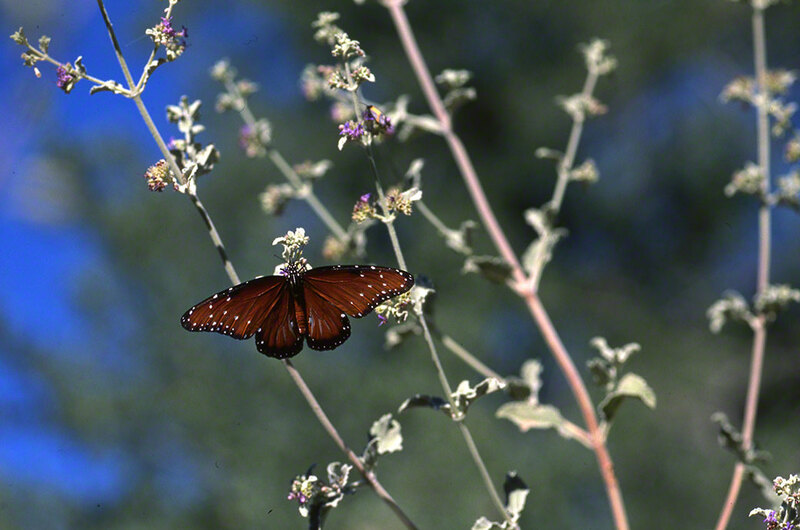 A Queen butterfly (Danaus gilippus) nectaring in an arroyo in White Tank Mountains Regional Park, west of Phoenix, Arizona. Backstory? I found the arroyo, but after working through it for several hundred yards, I did not find any plant in flower. Why would a plant produce flowers in this unrelenting oven of an arroyo? Then I spotted this gentle beauty, with . . . flowers. Tiny flowers. Queen and I were both happy to find what we were looking for, so my approach enabled this image. What did I do? Bird in the hand. I stationed myself there, and with baby blue sky, here is the result. Closely related to the the much discussed Monarch butterfly, the Queen’s host plants are similar to those of all Danaus butterflies, Asclepias plants, milkweeds. So tomorrow morning, as I psyche myself to go out and shovel, I will first open my iMac and soak in this image, a butterfly nectaring in . . . a veritable oven, and overjoyed for it. No doubt! It’s wearing a beautiful warm brown coat flecked with white sprinkles. Arizona desert is a gift of beauty. Good. Hey, WG, who is John?